The autumn colours are at their best in early November and looking from the window or the garden, the woods and the fell sides almost glow at times, particularly late in the afternoon as the sun is setting. It has been quieter since half term and with the shorter days feels as though the end of the season is close. I am fully booked until the middle of the month and then have a break until Christmas. 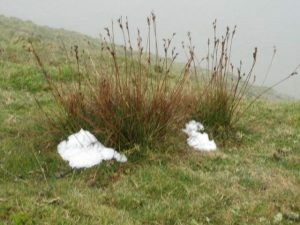 The weather recently has been quite acceptable which was particularly nice for families on their October week break but it generally has not excelled itself for the past few months, although there have been some glorious days. There has been a band of cloud and rain sitting firmly over the North West but most visitors have been very philosophical about it and it has seldom rained all day! There has been a lot of positive thinking eg. that the Lake District wouldn’t be so beautiful and green if it weren’t for the rain etc! I met a fellow walker during a particularly wet weekend who had spend the day enthusiastically photographing waterfalls as his group’s planned walk had been cancelled because the weather was too bad! 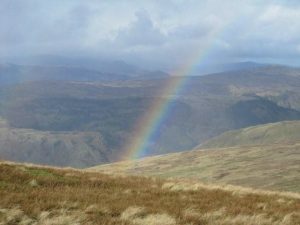 There have been some amazing and surprising rainbows: I saw one from Seat Sandal a couple of weeks ago and saw the first snow on the same walk on Dollywaggon Pike! The buzzards and kestrels are quite close by at present. I often see a buzzard in the wood behind the house when I take the dog out in a morning and there was a kestrel in the garden recently. The fieldfares have arrived and are flittering about everywhere in noisy flocks. I try to see if there are any redwings amongst them but they move about so quickly it is difficult to tell. I went down to Leighton Moss RSPB Reserve during the week and saw the starlings gathering at dusk to give a spectacular aerobatic display: it was incredible to watch, there must have been thousands of them wheeling and weaving around overhead. I have now joined the Theatre’s Ambassadors scheme so if you are coming to stay next year I am able to give you vouchers for £2 reduction on the price of tickets at most productions!